Valentine's Day Oreo? Cookies is rated 4.9 out of 5 by 14. Rated 5 out of 5 by CP1031 from Intact and fresh! I ordered chocolate covered Oreos for my daughter at college and they arrived intact and fresh tasting. Thank you! Rated 5 out of 5 by LizzZ from Absolutely Excellent!!! I bought these for my husband for Valentine's Day. They came right on time, they were packaged beautify, and were absolutely delicious! I will be ordering from GourmetGiftBaskets again. Rated 4 out of 5 by DeeMc from Delicious and Pretty! Great and unique treats - well received and enjoyed, nicely presented in a gift box too! Rated 5 out of 5 by Mragle from They were a hit! I bought these to send to my son in North Carolina for Valentines. He said they were really good and were in tip-top shape when they arrived! Just like you promised! Thank you for helping me help my son so far away to have a Happy Valentines Day! Rated 5 out of 5 by Evee1 from Tasty Cookies! This was the perfect Valentines gift! I'm glad I placed the order. Rated 5 out of 5 by Lynns407 from Good gets better I bought these as a treat for my Aunt who loves chocolate and cookies. She absolutely loved them. She said they were almost "too pretty to eat." She did anyway and kept them out of sight of her visitors so she wouldn't have to share! Rated 5 out of 5 by Irene from Valentine's Day Food for Thought We sent these to our daughter's workplace for Valentine's Day as a surprise. We should have known not to send them there as she ended up having to share with her co-workers & boss. Pretty sure she's going to get bonus points with her review!! 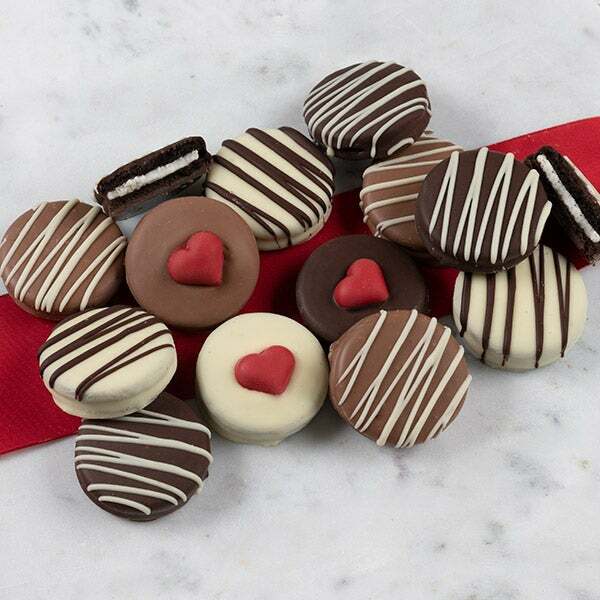 The sweetest ever assortment of Oreo® cookies that are drenched in delicious white, milk, and dark Belgian chocolates, then embellished with a sweet confectionary drizzle and red heart-shaped candies. We can't think of a sweeter Valentine's Day gift!